Introduction: Improving integration between basic science and clinical application is essential in medical education. Anatomy courses can do this by focusing on medical imaging interpretation. Most imaging textbooks rely on structural identification, which novice learners often struggle to apply to the health care environment, particularly in complex regions like the pelvis, which is multifaceted and differs substantially between sexes. To address this deficit, this resource extends our imaging-based tutorial series. Methods: This tutorial was a self-administered PowerPoint incorporating X-ray, computed tomography, and magnetic resonance imaging, which are all often used for the pelvic region, as well as self-quizzing and clinical applications. Using repeated-measures, control/experimental design, the tutorial was evaluated as a review tool for 57 Australian medical students in preclerkship years. Participants were evaluated by a rating self-efficacy scale, knowledge-based testing (multiple-choice, short-answer, and identification questions), and feedback to open-ended questions. Results: Results indicate that the tutorial significantly improved direct knowledge (p = .006), as the experimental group’s posttutorial scores for direct questions were superior by 21% on average. Significant improvements occurred specifically for direct short-answer and indirect image-identification questions. Discussion: These results suggest the tutorial is an effective review tool. While previous tutorials were evaluated as adjunct tools, this tutorial was evaluated post–anatomy teaching with similar results. Students improved in direct and applied anatomy following tutorial exposure. This suggests that the tutorial series comprises valuable review and supplementary materials. None of our tutorials have been evaluated as a sole mechanism for teaching anatomy or imaging. Identify pelvic anatomical structures in a variety of medical imaging platforms. Demonstrate comprehension of core pelvic anatomy. Identify common pelvic pathology on medical images. Apply knowledge of pelvic anatomy to clinical scenarios and/or applications. The transition from learning basic sciences within the classroom environment to applying this knowledge in a working form within the multifaceted, patient-focused clinical environment remains one of the greatest challenges for medical students.7 In the health care setting, learners rely on historically unfamiliar educational resources such as biochemical testing and radiologic imaging, as opposed to more traditional educational tools such as lectures and tutorials. There has consequently been a push towards incorporating clinical concepts into early-stage medical teaching in order to ease this transition. The benefits of integrating clinical teaching into the teaching of the basic sciences are being continually investigated in numerous areas of medical education, including anatomy,8,9 histology,10 and neurobiology.11 Our tutorial seeks to help address the gap between basic science and clinical medicine on a small scale, by adding to our medical imaging tutorial series, which engages users to relate anatomy knowledge to medical imaging, radiological concepts, and clinical correlates. Where previous tutorials in the series have focused on the teaching of upper limb, lower limb, and thoracic anatomy,12-14 this tutorial has been developed for the pelvic region, which is a complex anatomical region especially for novice learners. The pelvic area contains many structures and organ systems that can be difficult to integrate. Our teaching modality, a step-by-step walk-through of the area through radiological images segmented into systems, is well suited to address this issue and help students create a structural understanding of the region that they can apply to their clinical experiences. The tutorial specifically targets novice learners of anatomy, such as medical students in their preclerkship years. In future years, we aim to broaden this series and develop a complete set of self-administered PowerPoint anatomy tutorials that cover all major anatomical regions. Extending beyond traditional radiologic teaching, this tutorial, similar to previously published ones in the series, facilitates user understanding of key anatomical relationships and works to improve learners’ clinical application of anatomical knowledge by teaching anatomy through medical imaging. The tutorial shares a resemblance with previously published MedEdPORTAL resources that endeavor to incorporate radiology into anatomy teaching, such as through team-based learning modules15 and self-guided anatomical atlases,16 as well as resources developed specifically for the teaching of pelvic anatomy in clinically oriented ways, such as problem-based learning17 and three-dimensional modeling.18 This tutorial adds to the literature through its adaptability for use in a variety of settings, as the resource is not confined to any particular teaching arrangement and can thus be rearranged according to the specific situation and objective of its learners. Unlike many of the previously published resources, it is easy to implement at any time by students and does not require extensive preparation or setup. Imaging modalities used in this tutorial include radiographs, computed tomography (CT), and magnetic resonance imaging (MRI). This enables a comprehensive overview of pelvis anatomy while increasing students’ exposure to various imaging techniques. The research presented here investigates the impact of this pelvis imaging-based tutorial on anatomy knowledge, particularly as a review tool for students with prior pelvic anatomy knowledge, and on participant confidence with imaging in clinical situations. Although ultrasound images are another modality typically used for imaging the pelvic region, excluding ultrasound from the tutorial was a pedagogical decision, as the tutorial targets novice learners. While ultrasound imaging is increasingly being taught in medical school anatomy programs,19 understanding the intricacies of ultrasonography is complex and was deemed beyond the scope of our hour-long review tool. However, the PowerPoint format offers the flexibility to allow users to add to the tutorial. In this manner, educational slides focused on ultrasound can easily be added to the tutorial to increase integration into a given curriculum, with the present depth of knowledge provided being geared towards beginners. One of the tutorial’s advantages is its flexibility for use in a variety of settings. Once students have access to the PowerPoint file, they can review the tutorial at any time and learn at their own pace. Although we tested the tutorial on a group of undergraduate Australian medical students who had just completed their core pelvic anatomy teaching, the knowledge can be extrapolated to various health sciences anatomy curricula. The PowerPoint design enables learners to enhance the depth to which anatomical principles are covered by adding slides when used with a comprehensive anatomy program or to simplify teaching through slide removal in the context of a more basic course. Principles of radiological imaging are covered in the introduction, which may serve as a basis for more in-depth exploration of imaging modalities if required. All major anatomical areas of the male and female pelvis are covered, including genital organs, bony landmarks, pelvic neurovasculature, and muscular structures. The tutorial was not designed to be a stand-alone tool for the teaching of pelvic anatomy. It can be incorporated throughout the traditional anatomy course, including as an introduction, alongside laboratory and lecture-based learning, or in revision for examinations or other assessments. It would be suitable for group tutorials and simple to facilitate in a group setting, with minimal logistical effort required. Our testing of this tutorial involved a standard tutorial room setup where students brought their own laptops and worked independently over the course of 1 hour. However, several room arrangements would be appropriate for administering the tutorial. Basic room setup could include students seated in small groups, with a projector at the front and a computer for the facilitator to guide progression through the tutorial. Alternatively, students could work at their own pace on individual computers while a facilitator addresses specific anatomical areas using specimens or models. Finally, as the tutorial is self-directed, students have the option of accessing it on their own devices at any time, meaning that a formal room setup may be unnecessary as students can learn at home without the need for a facilitator. Principally, the pretest and posttest materials were developed for the testing phase of our research; however, they are useful tools that may be incorporated into anatomy programs to assess students’ knowledge before and after tutorial exposure. By undertaking these tests, students could identify areas of weakness in pelvic anatomy knowledge and collaborate with supervisors to guide the focus of their study. Testing would be administered according to the facilitator’s discretion and would depend on how the tutorial is delivered. For example, for basic anatomy teaching, the tutorial could serve as a single group-learning session with tests on either side. More in-depth discussion of the concepts covered in the tutorial may require several sessions to cover all the areas studied. The assessments (tutorial, pretest and posttest quizzes) provide an opportunity for learners to self-assess, giving educators the option to flip the classroom. Given the tutorial’s length and student feedback, we recommend an hour-long session to move through the PowerPoint. The pretest and posttest (Appendices B & C) administered to students featured multiple-choice questions (MCQs), image identification, and short-answer questions (SAQs). Both pre- and posttest examinations focused on similar core concepts but used different questions to minimize testing bias. Pilot testing on third-year medical students validated pre- and posttest exams. These students were a year ahead of the students evaluated in the study and had completed the same anatomy program as the study participants. Any test discrepancies were addressed, and negatively performing questions were removed prior to formal study evaluation. An answer guide (Appendix D) was used to ensure consistency across markers. Participation was voluntary and anonymous for both test cases and formal testing, had no impact on academic grades, and was assessed in a deidentified manner. Voluntary recruitment resulted in 57 second-year medical students who were then randomly assigned to the control group (28 students) or the experimental group (29 students). The group was composed predominantly of females (40 students) compared to males (17 students). The mean age of the group was 20 years. Two facilitators coordinated the session. Students in the control group completed the 30-minute pretest and the 30-minute posttest before being given access to the tutorial. Students in the experimental group completed the 30-minute pretest and then had 1 hour to access the tutorial before completing the 30-minute posttest. Experimental group participants were given no formal instruction on how to proceed through the tutorial; this portion of the study was self-directed. All students were given access to the tutorial immediately following tutorial evaluation to ensure that they all had equal access to additional learning opportunities. Following participant access to the tutorial, both the control and experimental group participants completed a rating scale survey to evaluate the impact of the tutorial on students’ perceptions of radiology and the content covered within the tutorial. Prior to undertaking testing, a two-tailed power analysis was performed; based on previous tutorial effects,9-11 the effect size was identified as 0.8, with a significance level of 0.05. Based on the total participation with 57 students across the two testing groups, the study had a power of 0.843, meaning there was minimal likelihood for type II error. The Monash University Human Research Ethics Committee approved this study (Project ID 942). Student performance was compared between the experimental and control groups for both the pretest and posttest. Analysis was performed for each question type (MCQ, image identification, SAQ). Analysis also differentiated direct questions, which assessed information that could be gained through the imaging tutorial intervention, and indirect or applied questions, which assessed knowledge that students would have to infer from learned knowledge. Results were produced using percentage change and a two-tailed paired t test due to convention and differences in questions between the two tests. Results of student testing indicate that among the total cohort of 57 second-year medical students, the 29 students in the experimental group performed significantly better in several areas compared to the 28 control group students. For direct questions, experimental group students performed significantly (p = .006) better on the posttest compared to the control group by an average of 21%. Pretest results were only mildly in favor of the experimental group, whose results were on average 0.27% higher; however, this result was not statistically significant (p = .80). For the indirect questions on the posttest, the experimental group was superior by an average of 14%, but this was not a significant result (p = .16). The results of the pretest, however, favored the control group, whose results were on average greater by 4%, but not significantly (p = .86). Separate analysis was performed for each question type to determine which areas of knowledge were most considerably affected by the tutorial. There were no statistically significant differences for any question type, direct or indirect, on the pretest. On the posttest, the experimental group was significantly better in the direct SAQs (t = 2.8, p = .03). 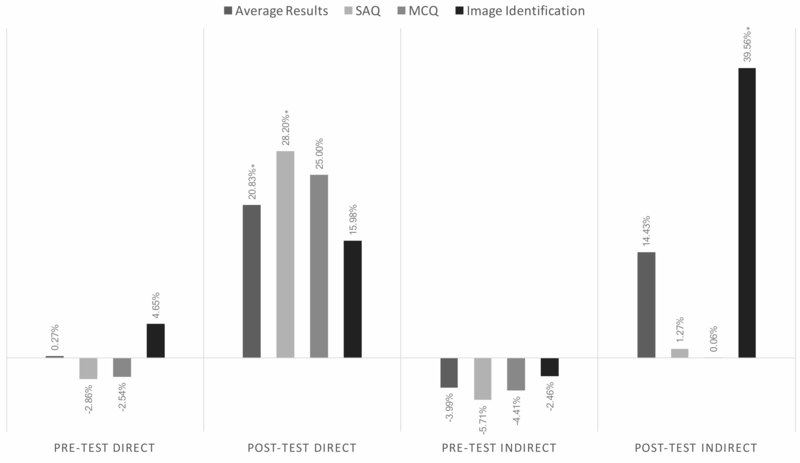 The experimental group was also superior to the control group in direct MCQs (t = 1.9, p = .077) and image-identification questions (t = 1.3, p = .23), but not significantly. For indirect questions, the experimental group was significantly superior for image-identification questions (t = 3.1, p = .014). The experimental group was also superior for MCQs (t = 0.087, p = .93) and SAQs (t = 0.18, p = .86), but these results were not statistically significant. The percentage change for all question types is shown in Figure 1.
group’s. Abbreviations: MCQ, multiple-choice questions; SAQ, short-answer questions. The subjective assessment was completed using a rating scale. This demonstrated that the majority of students found the tutorial somewhat good (54.39%) and extremely useful as a review tool (49.12%). The majority of students felt moderately more confident with pelvic anatomy and radiology. All students felt they had sufficient time to complete the tutorial in the allotted 1-hour session. The full range of responses to each question is given in Figure 2. Figure 2. Student responses to open-ended survey questions regarding the pelvic anatomy tutorial. Transfer of anatomical knowledge from the classroom to the clinic is a difficult aspect of undergraduate medicine.1,20 An oft-presented solution to this struggle is to increase clinical contexts in which basic science content is presented.21,22 Here, we set out to accomplish this by creating a self-paced PowerPoint medical imaging tutorial designed to illustrate key anatomical structures and relationships, clinical concepts, and medical imaging contexts in a manner similar to our previous resources.12-14 While this tutorial extended the series by focusing on a novel area of anatomy, the tutorial evaluation differed. The flexibility of the PowerPoint format allows users to identify the location that they choose to begin with and focus on, which lets students reduce the length of the tutorial as needed. Furthermore, the flexible PowerPoint format enables educators to choose to offer only some slides to their students or to break the tutorial apart into smaller sections. Our tutorial also shares a resemblance with several other tools designed for the teaching of pelvic anatomy, although it has numerous unique aspects that justify its addition to the existing educational resource base. A similar resource23 that incorporates radiographic images into the teaching of pelvic anatomy is available on MedEdPORTAL. This resource is also in PowerPoint form, but it has numerous distinct differences from our tutorial including the lack of an introduction to radiological principles. Our tutorial, primarily developed for novice learners, allows students’ familiarization with numerous medical imaging modalities that are then explored in the latter part of the tutorial with specific examples from the pelvic region. Unlike that other resource, our tutorial includes clinical correlations and incorporates additional imaging modalities on top of MRI and CT (e.g., bladder studies and X-rays). Additionally, our tutorial appears to be more tailored to novice learning of pelvic anatomy compared to the other module, which is more comprehensive, going through an entire CT and entire MRI report, which takes more time and detailed learning that may not be appropriate for a novice audience. Another published MedEdPORTAL resource24 covering radiological images of the abdomen and pelvis bears similarities to our work. However, unlike that interactive flash tutorial, our tutorial is compatible with all devices because of its PowerPoint format. The flash tutorial also does not include clinical correlations of pelvic anatomy. Another 3D virtual pelvic anatomy tutorial25 covers CT and MRI modalities but is not freely accessible. Finally, the An@tomedia database26 has been shown to be beneficial to novice students, especially for self-directed learning and revision, but is less focused on radiology than our tutorial and appears not to have the flexibility for incorporation into many diverse learning environments. Regarding tutorial design, there were numerous difficulties faced in the production of this PowerPoint resource, particularly around formatting. Numerous styles were experimented with before finding a way to deliver labels and images in an appealing and engaging manner while upholding the anatomical integrity of the areas presented. Structuring the order of slides was also a lengthy testing process; possible options included moving from structure identification to clinical correlations and self-assessment, focusing on specific imaging modalities (e.g., axial CT, coronal CT, MRI) or learning by anatomical region. Finally, we found that the best transition through the slides would be, first, a general overview of the pelvic region, exploring male and female differences, and then homing in on specific organs while progressing from simple identification and normal anatomy to clinical scenarios and examples of pathology. Unlike our previous studies, this tutorial was evaluated only as a review education resource, with study participants having taken their anatomy coursework prior to the study, rather than as an adjunct anatomy learning tool, where study participants would be taking anatomy coursework simultaneously with the study. Despite this difference in experimental design, there were some similar findings: Exposure to the pelvic anatomy tutorial did significantly improve student participants’ knowledge outcomes on pelvic anatomy and their confidence in radiology. This significant improvement in exam results is particularly relevant in today’s teaching environments, as little expert facilitation was needed to guide students to reach these learning outcomes. In our current study, in fact, no direct facilitator instruction was given. The students were able to decide how quickly (or slowly) they reviewed the material and which sections they chose to focus on. The overall improvements in knowledge suggest that this minimal facilitator involvement still allowed for maximal learning. In implementing the tutorial, there were some challenges in ensuring students understood the structure of the testing and worked on the tutorial at their own pace without being influenced by others. Ensuring each student worked independently was important yet difficult to control, as collaborative learning could have compromised the results and prevented testing the value of the resource as a review tool for individual students. However, by having all students seated in a large laboratory room, rather than in multiple separate rooms, both invigilators were able to watch the students at all times to ensure they worked independently in completing the pretest and posttest. We also found that the students generally finished the tutorial in plenty of time. This suggests that the material was straightforward and could potentially be used in other settings, for example, as an introductory teaching tool before standard anatomy courses, lectures, and laboratory work. Interestingly, participants’ applied anatomical knowledge (knowledge tested that was not explicitly covered in the tutorial) significantly improved only in the area of structure identification, which suggests that using medical imaging did help improve anatomy knowledge within the medical imaging context but may not have helped improve application of anatomy to other clinical contexts. Given that extensive evidence exists concerning the difficulty of applying learning to clinical contexts,27-29 this discrepancy is not surprising. The finding does contradict our previous work wherein the overall improvement of inferred anatomy knowledge was significantly greater following tutorial exposure.12 This may be due to the differences in experimental design or because of the difference in complexities between the anatomical regions. In the previous studies, students were also participating in embedded anatomy curricula that may have helped improve their contextual applications in additional areas. Furthermore, pelvic anatomy is inherently much more structurally complex than upper limb anatomy, the tutorial that resulted in the most improvement postintervention.12 The pelvic area is complex due to the multiple organ systems it incorporates, including the gastrointestinal system, renal system, and genital areas, and particularly for novice learners, it is difficult to integrate these many structures and visualize the area spatially. Additionally, the pelvis is substantially different between males and females, as opposed to all other abdominal regions that have been previously covered in our tutorial series; this adds further complexity for students when learning the bony structures, organs, and blood supply. Given that spatial visualization has been shown to impact anatomy learning,30 the simple differences between the anatomical regions covered in each tutorial may in fact explain the discrepancies in outcomes. Future research will need to explore this further. The subjective data, based on increased student confidence, demonstrate the potential benefit of using this resource prior to clinical years. Evidence suggests that confidence in clinical anatomy knowledge is shockingly low.20,31-33 Therefore, it is a potentially important finding that exposure to our medical imaging PowerPoint tutorial improved student’s clinical anatomy confidence. This study adds to the growing body of evidence that even small doses of clinically relevant knowledge may positively impact student learning and confidence.34 However, this study did not test the long-term effects of students’ increased confidence, and it may well be that their perceived confidence had no lasting effect. Further research is necessary to explore the long-term outcomes. Both the quantitative and subjective confidence data strongly suggest that the tutorial was a successful intervention for consolidating knowledge of pelvic anatomy by enabling students to correlate radiology with scenarios they may encounter in the clinic. However, this tutorial is yet to be tested as a stand-alone learning resource; the impact of tutorial exposure for novice learners with no previous anatomy learning opportunities has not been explored. Further work could expand the concepts in the tutorial so it can be used in a stand-alone capacity. Additionally, a more robust measure of the tutorial’s effectiveness could involve assessing long-term knowledge retention and learner attitudes after students enter the clinical environment and determining if the knowledge gained translates to improvements in clinical reasoning and patient care. Tomic D, Marsland MJ, Lazarus MD, Brian PL. Development and learning impact of abdominopelvic medical imaging tutorial platforms. Poster presented at: ANZACA 2017 Conference; December 2017; Auckland, New Zealand.